Even if the Public Accounts Committee is able to hear from the whistleblowers it is not clear whether this will happen in public or private session. MEMBERS OF THE Public Accounts Committee (PAC) are divided on whether or not they should hear evidence from garda whistleblowers in public or private session. 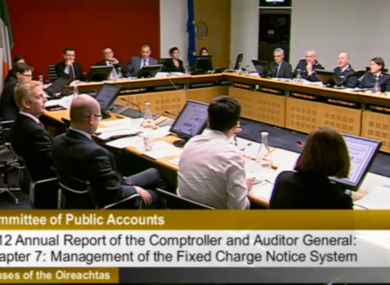 Committee members are set to come face-to-face with at least one of the two whistleblowers who have alleged that fixed charge penalty notices have been cancelled corruptly and illegally – claims that were robustly dismissed by the Garda Commissioner yesterday. The allegations are being advanced by a serving garda, Maurice McCabe, an ex-member of the force, John Wilson, both of whom committee chairman John McGu inness has indicated are willing to appear before the PAC. However, it is not clear if they wish to do so in public or private session. Martin Callinan told PAC members yesterday that he intends to take legal advice on whether or not to challenge the appearance of the whistleblowers before the PAC and could go to the High Court in the coming days to get a temporary injunction. But even if the PAC can hear the whistleblowers’ evidence, members are divided on whether it should be in closed or public session. He cautioned against hearing from the whistleblowers in public session given that the committee has never met with them before, and said that it is important to establish their willingness to appear publicly before deciding the best course of action. Sinn Féin TD Mary Lou McDonald said that the hearings with the whisteblowers “should be in public session unless there is some compelling reason to the contrary”. McDonald added that she sees no reason to “mark them out exceptionally as being a danger of using or abusing the platform of the committee”. Labour’s Gerald Nash said his “instinct” is that the meeting should take place in private session. Fine Gael TD Eoghan Murphy questioned whether the committee had even agreed to bring in the whistleblowers, saying: “As far as I am concerned no decison has been made to call in the whistleblower, and I am not necessarily sure that this should fall to the PAC. He echoed the views of Fleming, Nolan, and Nash that it should be “in the first instance in private session”. Meanwhile, Ross has been criticised by Fianna Fáil’s justice spoksperson Niall Collins for his comments this morning. Collins said he had “serious concerns about the approach that certain members of the PAC are taking” towards the gardaí. “Ross expressed surprise and disapproval at the fact that the most senior Garda officer in the country referred to ‘subordinates’ and presented it as evidence that junior Garda ranks are treated as ‘second class citizens’,” he said. Poll: Should the garda whistleblowers be brought before the PAC? Email “TDs divided on whether PAC should hear from garda whistleblowers publicly ”. Feedback on “TDs divided on whether PAC should hear from garda whistleblowers publicly ”.